The River Rats Dueling Pianos are the longest running dueling show in Minnesota. Originally from Mississippi Live in Minneapolis, Jim Steinworth and Cal Spooner have continued to entertain crowds from Ltl’ Dittys in Mall of America to The Beach in Las Vegas. We are the masters of interactive rock-n-roll comedy. We have not only performed all our lives, but are also trained comedians. Because we do a request driven show, every show is approached differently per the audience at hand. 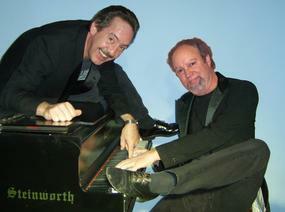 We bring your requests to life on Grand Pianos with a big dose of humor. Everyone joins the fun of picking songs, singing along, and celebrating the fun events in life. Corporate entertainment is their specialty, not a side business. We do a ‘G’ rated show, not ‘PG’ or ‘G-PG’. We travel wherever people want to have fun. We bring Steinworth Grand Pianos, Sound, and Lights. The River Rats Dueling Pianos are a request driven show. The vast repertoire of songs that Cal and Jim are capable of playing (or faking well) is what makes the show different for every performance. Our song-list is determined by the audience at hand, they control what gets played. We perform songs of all kinds.